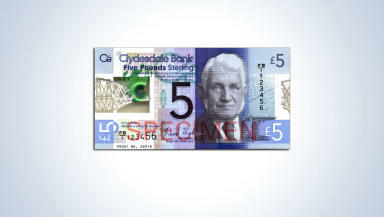 The £5 note, which is made of a more durable material than existing paper money, is available from Clydesdale Bank. The first plastic banknote to enter circulation in Scotland is being released on Monday. 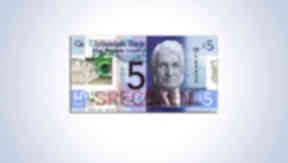 The new £5 banknote will be available from Clydesdale Bank branches. The note, which is made of a more durable material than existing paper money, is being launched to coincide with the 125th anniversary of the opening of the Forth Bridge. A total of two million notes, which combine images of the bridge with new security measures to create a unique design, will eventually enter circulation. Plastic notes have been used in Northern Ireland for some time, but the Clydesdale Bank notes are the first plastic currency to be used in mainland UK and In a first for UK currency, the note will include a "Spark Orbital" security feature. This appears as shiny ink in the shape of Scotland over a transparent window which changes colour as the note is moved and tilted. Debbie Crosbie, acting CEO of Clydesdale Bank, said: “We take our responsibility as an issuer of banknotes seriously and are extremely proud to once again be leading the way in innovation. “Our new polymer notes are more durable and secure, which will deliver a positive impact for the public and businesses. "We have achieved that while also creating a striking and beautiful design which celebrates an iconic Scottish landmark." The new £5 note, which is smaller than the existing currency, has been designed by De La Rue plc and in a first for Europe uses its a Safeguard polymer substrate. The commemorative banknote also features a portrait of Sir William Arrol, one of Scotland’s most celebrated engineers. His company, Sir William Arrol and Co, constructed the Forth Bridge and was also responsible for a number of other famous structures including the giant cantilever Titan Crane in Clydebank, which also appears on the new note.